'The Forestroamer' is proof positive that Woebegone Obscured have never stopped thinking outside the box when it comes to creating menacingly beautiful Doom atmospheres. What's in a name? Sometimes, nothing...as is literally the case with Woebegone Obscured, evocative as it may sound. Whatever the native tongue (Danish, in this case) original was meant to be, it not only didn't quite survive translation, but is about as grammatically incorrect as it's possible to be using only two words! And yet, though the actual non-meaning is 'a sad-looking [missing noun] was blocked from view', it's still possible to infer a broad intention of something like 'concealed sadness'. Which also goes to show that sometimes it isn't necessary to stick entirely to the rules, if a concept can transcend them: something WO manage with their name and their music. From the very outset - their varied and menacing Funeral-Doom-with-extra-hooks 2007 debut 'Deathstination' - WO have never shied away from driving into their visions of darkness with a full head of steam, whatever it takes. Generally, that means a wild mix of elements taken from across the extreme Metal spectrum, but blended successfully and largely seamlessly into an expansive whole. Aesthetic Death, producers of the rather tasty and appealing 6-panel digipack CD that presents this release, describe it as the band's "most accomplished and refined work to date...it dexterously meanders amidst eclectic influences, through monolithic Doom, Black Metal, Death Metal, Ambient, Prog and Rock...Melancholic, melodic, progressive, intense and intricate". To be fair, that's not a bad summary of all of their recorded works, though I think I'd still add Funeral into that mix, even if it doesn't feature quite as heavily in later works. It's hardly controversial that trying to ladle that many different elements together generally ends up with either an unholy patchwork of unfocused incoherence, or a cleverly-blended mix of all sorts of smoothly-incorporated familiarities that manage to sound quite distinct and individual - fortunately, WO fall very much on the latter side of the equation. So, what, specifically, can you expect from 'The Forestroamer', in terms of adding to that canon? For a start, something a little more defined than the previous 2014 'Deathscape' EP, with its somewhat disparate selection of new tracks and cover versions. This has more of the coherence of the last full-length venture, 'Marrow Of Dreams' and expands on that conceptually with a more consistently narrative saga. 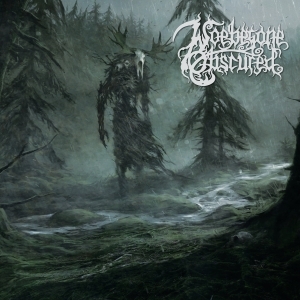 And while the all-included lyrics aren't especially specific, beyond creating images of some sort of malevolent and misunderstood forest-dwelling spirit, the excellent cover art (by Stargrave) invokes the classic folklore imagery of Herne the Hunter. Though, depending on your degree of literary classicism, it could just as easily touch on the tale of Grendel, or the far more modern exploits of Swamp Thing, as equally valid retold archetypes. Musically - well, although 'The Forestroamer' comes across as a more smooth and polished exercise than its predecessors, with a softer - or at least, less raw - production, less abrupt transitions, and a little less aggression, that's all to its benefit. The distinctive interplay of continually-changing instrumental threads, sweeping from quiet contemplation to brutal outburst and back, is still there, as is the contrasting mix of clean and harsh vocals, just presented with a little extra slickness and completeness to the soundstage. That's not to suggest it's in any way lightened the atmosphere - as always, WO excel at maintaining a deep, menacing feel throughout. Even in the quietest, most tranquil moments, there's a certain uneasiness: like dappled sunlight through the trees casting darker shadows into the threatening forest gloom. It's a profound and absorbing mood, executed to perfection. Within that overarching atmosphere, though, there's space for each of the compositions to evolve. In true Prog fashion, that's a deft and sinuous process, filled with a variety of time signature and melody changes, each one contributing and building towards a unique conclusion of its own, whilst also advancing the album as a whole. Flitting between the anchors of drums, guitar and vocals are wisps of natural effects, synths and guest vocals (including Natalie Koskinen's very recognisable contribution to the title track), adding layers of mystery and enchantment to the journey. Don't be too surprised to realise that you've ventured a long way further than you might have expected between the opening bars of turbulent, melodic Death/Doom and the last moments of plaintive, rainy ambience. Far enough to be completely lost in the twists and turns of 'The Forestroamer''s perilous realm, with the final soaring declamation of "Fear my black heart..." echoing in your mind. It's often the case that the 'doomier Opeth' comparison holds water whenever Prog and Death crop up in close proximity. Not here: for my money, Woebegone Obscured are far too rooted in a core of Doom, and the Prog influence is, if anything, more skewed towards -Rock than -Metal. If I had to compare, it would be to something like a 'proggier Norilsk', in that both bands excel at creating a self-contained, consistent, and beautifully bleak atmosphere based around Death/Doom. And, because there's more detail and variety packed into this 45-odd-minute gem than I could possibly describe in any depth, I can't recommend strongly enough that you take the plunge and discover it all for yourself.